See what PRMG Cares is doing in local communities across the nation! Largely inspired by several PRMG Family members enduring unimaginable life threatening hardships, PRMG Cares decided to promote the well being of the PRMG Family, providing them the necessary support to get them through these difficult times. Below you will find some of our past and current recipients of Giving Back to the PRMG Family. Ron has been battling stage 4 cancer since October 2016. He joined PRMG in January 2014 and had been a loved member of PRMG's Sales team ever since. Ron has a PMA "Positive Mental Attitide" despite his hardship. Heather was diagnosed with stage four breast cancer. PRMG Cares: Giving Back to the PRMG Family, sent her and a friends to see Blake Shelton, in addition to providing funds to help her financially throughout this difficult endeavor. Loreyla Garofalo was diagnosed with Multiple Sclerosis in 2002. PRMG Loan Officer, Fausto, her loving husband struggled to support the family financially while also being her primary caregiver. PRMG Cares: Giving Back to the PRMG Family raised $8,000 to help offset some of the Garofalo's financial burden. Full Bellies, Warm Hearts invited PRMG Cares to participate in Full Bellies, Warm Hearts, an initiative put together by Home Aide Inland Empire, that aims to collect and provide school supplies for children who are homeless or are in transitional housing. PRMG Corporate employees participated and filled up two full boxes of supplies, including backpacks, pens, pencils, paper, notebooks and so much more! Members of the PRMG Kaukauna branch at their third annual Golf Charity event. The event benefited the Desert Veterans of Wisconsin, Fox Valley Chapter. The Desert Veterans of Wisconsin, Fox Valley Chapter is presented with proceeds raised during the charity golf outing. Shoutout to the #PRMGPembrokePines branch for partnering up with Operation Christmas Child. The branch worked together to package toys and school supplies for children in need for a total of 165 boxes! PRMG Naples Operations Manager Deanna Birr crossing the finish line! Lustgarten Walk for Pancreatic Cancer Research! Deanna Birr and her family at the Lustgarten Walk for Pancreatic Cancer Research! The Edina Branch Team volunteered their time to provide food to those in need. 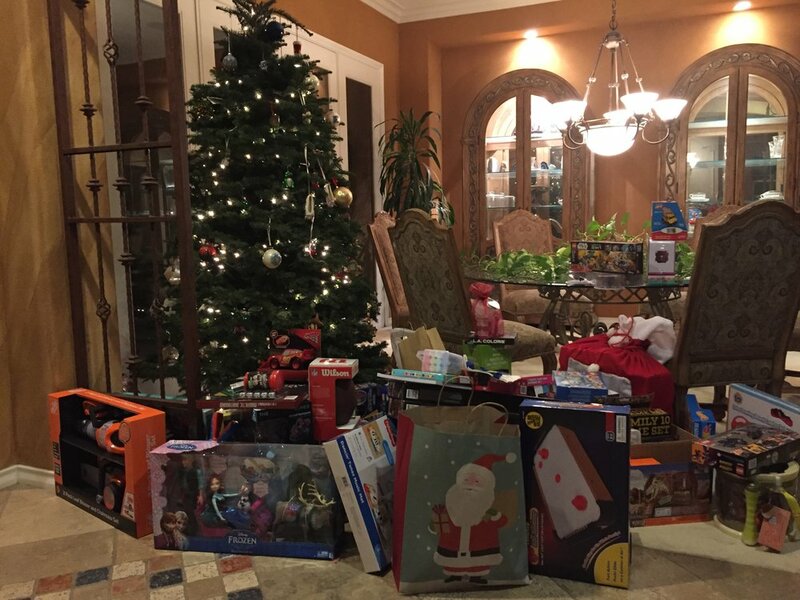 PRMG Loan Officer, Kelly De Chavez, held an open house party and toy drive and collected over 50 kids toys that were donated to Connecting Hands OC! Edina Branch Manager, Forest Green, volunteering with a local soup kitchen serving meals the weekend before Christmas! Edina Production Manager, Clinton Rooney, volunteering with a local soup kitchen serving meals the weekend before Christmas! Hannah Rounsaville, Registration Specialist I, collected items to send to a family in need after Hurricane Harvey wrecked their home. The PRMG Miami branch is collecting everyday items to assist those in the Florida Keys who were affected by Hurricane Irma. Volunteers form an assembly line to add school supplies to backpacks for students in need. Gina Montes, Loan Officer at the PRMG Sarasota Branch, and her daughter volunteered stuffing backpacks for students in need! PRMG branded giveaways for the tournament participants! PRMG Golf Balls were used during the tournament. PRMG Lincoln Loan Officers working the booth at the tournament. Theresa Smith and Michelle Evans waiting to be called up for their donations. Phyllis Winchester, the first donor of the day, was all smiles after her donation with the American Red Cross. 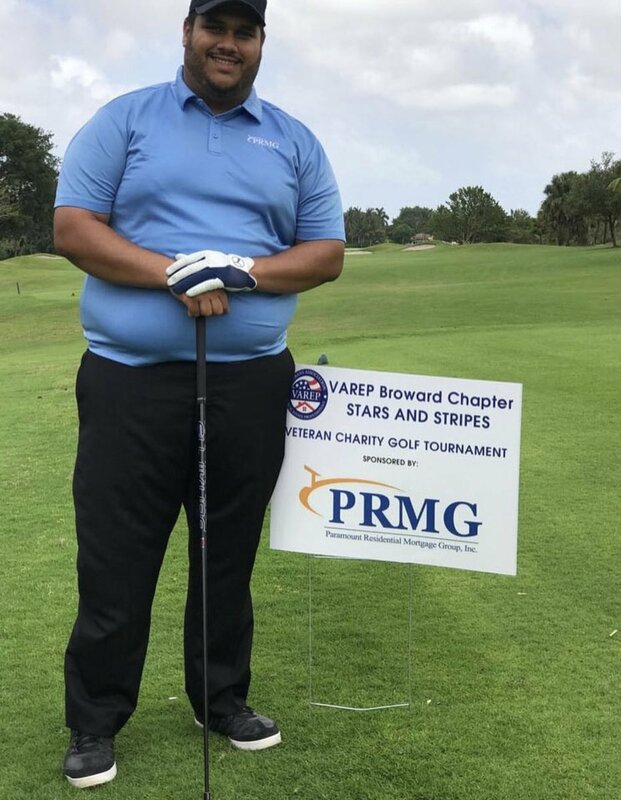 Juan Carlos Pichardo, friend of the PRMG Coral Gables Branch, participating in the charity golf tournament honoring veterans. Branch Manager, Forest Green taking a break after picking up trash at the VA Cemetery in St. Louis Park, MN. 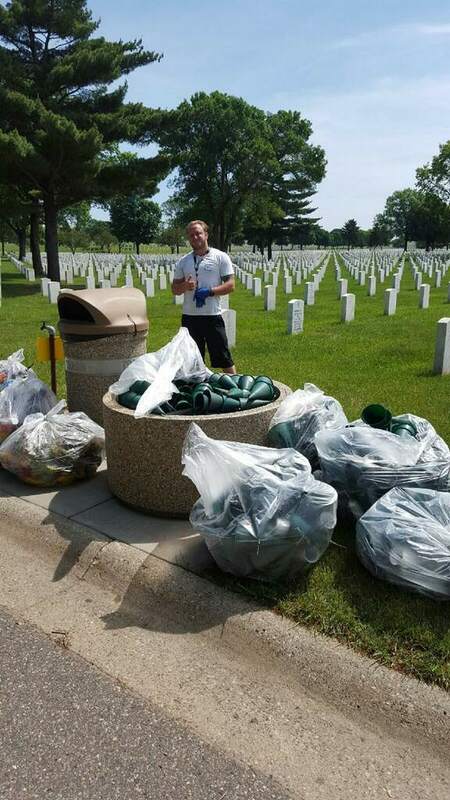 Loan Officer, Ryan McGrath helping clean up trash at the VA Cemetery in St. Louis Park, Mn. Col. David Schaffer signing his book at the Next Level Foundation Golf Tournament sponsored by our St. Louis Park, MN branch. Wil Reyes unloads a truck full of donations to send to the Phillipines. After Typhoon Haiyan and Typhoon Yolanda struck the Philippines, the people were in major distresss and were in need of every day items that we may not think twice about, such as clothes. 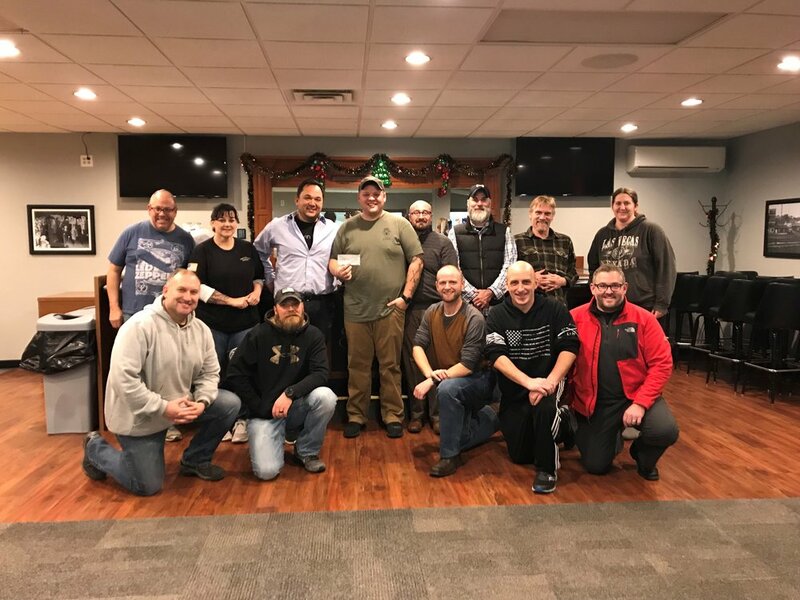 A wounded war veteran, told his courageous toru during his time served in the U.S. Army while deployed in TalAfar, Iraq from 2006-2007 and how the Wounded Warrior Project has helped him recoup, more forward and help others who have endured similar experiences. Paul Rozo, CEO and Robert Holliday, COO handed over a check to the Wounded Warrior Project for $38,600 raised over the course of a year through $50 per closed loan with PRMG. From left to right, Paul Rozo, Christy Rozo, Blake Shelton, Heather Skipworth and Robert Holliday. Heather received the ultimate suprpise when she had a personal photo-op with none other than Blake Shelton. Heather Skipworth outside of her home holding some of the gifts included with her surprise trip to fabulous Las Vegas, NV. Heather Skipworth and her childhood friends, Brandy, Nicole and Cecilia, posing for a few pictures before departing to Las Vegas. Corona Corporate Employees wore pink in support of Heather Skipworth! PRMG Employees dined at the local Graziano's Pizza Restaurant as a portion of the proceeds went towards Heather Skipworth's cause.